I have knitted on and off, but, to-date crochet seems to be my favorite - it flows easily, comes more naturally, and most of all, it relaxes me! The toddler sweater here is for my little nephew who is about 18 months old. I just eyeballed and made it a little larger for my 2½ year old, so am fairly confident this will fit my nephew easily with room to spare - plus, he can grow into it. It feels like such a wasted effort if I make sweaters the right size 'coz after a few months of wear, children outgrow it! 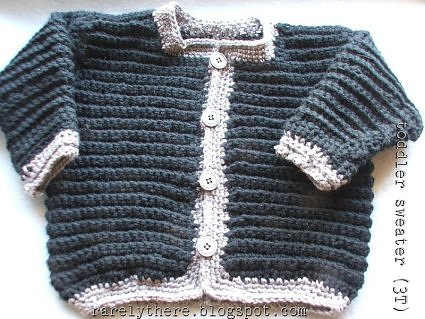 The pattern is based on Caron's Tweed Baby Jacket. I would have liked to add pockets... maybe for the next one. What a darling little creation!